I hope that your week is going good! Mine has been pretty good. I really can’t complain because I have had a lot of time in my studio. Missed some deadlines because of doctor appointments, but I may be able to catch up very soon. This is Artist of the Week at Sweet Pea Stamps (SPS). 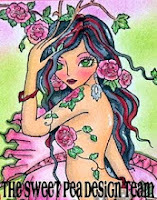 Our artist is Brigid Ashwood, along with her Phunky Phairies. She has some of the most interesting images to work with. I don’t think that I have a favorite, but I did choose Repose. I love Steampunk and when I get to practice making Steampunk (I still need a lot of practice), I jump at the chance. You can find Repose and other Phunky Phaires by Ms. Ashwood in the SPS shop. This particular rubber stamp is found on Plate #104. Repose needed to be a little melancholy, so the colors I went for were rust and mauve greys. I colored her with Copics and added a few accents with a Star Dust gel pen, which is one of my favorites to use. My die cuts were a lot of fun to add. In the left corner is Alice’s Clock Statement Corner designed by SCACD. 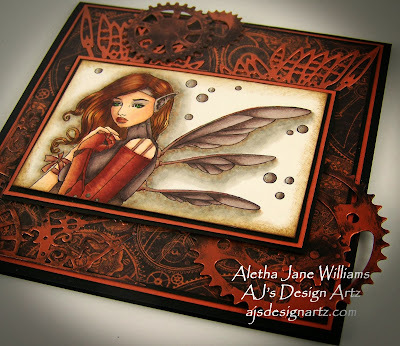 Another fun die by SCACD is the Steampunk Wing Set. Those I placed at the top under my main image. My sprockets and gears are Spellbinder’s Sprightly Sprockets. Before I glued all die cuts down, I swiped them with Viva Décor Inka Gold in copper, let that dry, and then buffed with a paper towel to get a metallic shine. The cardstock is from my favorite company for cardstock Stampin’ Up!. I used basic black and really rust. The designer papers are Graphic 45’s Simply Steampunk, a gorgeous collection. We have a fun challenge over at One Sweet Challenge. The theme is “things that go bump in the night.” If you do enter, and use a SweetPea image, please come by our SPS Facebook group and share your little piece of art. There’s a lot happening at Sweet Pea Stamps. Stay up-to-date on them all by “liking” our SPS page. Thanks for stopping by. Be sure and stop by every day for more Sweet Pea inspiration. Stunning work of art! Gorgeous! You are simply amazing! 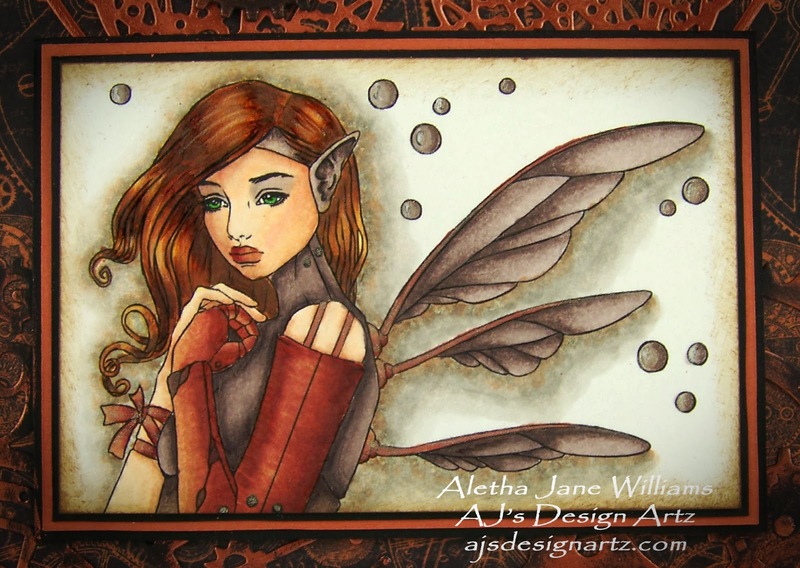 Wow Aletha, this is gorgeous! 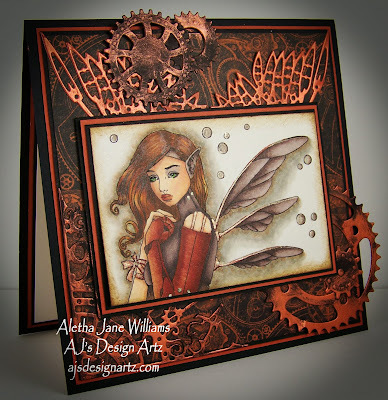 You do steampunk so well!